The women who settled in the Old West defy stereotypes. Marcia Hensley is a contributor to Writers on the Range, a service of High Country News in Paonia, Colorado. She writes in Farson, Wyoming, where she’s finishing an anthology of writing by single homesteader women. Thanks to Western movies and popular novels, stereotypes come easily to mind when you think of women of the early West. There’s the saint in the sunbonnet, the soiled dove, the schoolmarm and the rancher’s daughter. Or maybe you remember dramatic figures like the Lewis and Clark guide Sacajawea, or Calamity Jane of the perfect aim. But there’s a group of gutsy women that’s seldom acknowledged, let alone recognized: single woman homesteaders. Historians estimate that about 12 percent of homesteaders in Colorado, Wyoming, Montana, North and South Dakota, and Utah were single women. Lured by the Homestead Act, which gave any 21-year-old who headed a household the right to homestead federal land, independent women crossed the country to become landowners. By the early 1900s, a woman could load her belongings on a train and in several days make a trip that once took months. When she arrived, a land-locator took her by wagon or Model T to find her claim. Revisions in 1909 and 1912 in the Homestead Act also reduced the amount of time needed to “prove up,” and they doubled the amount of land that could be claimed. 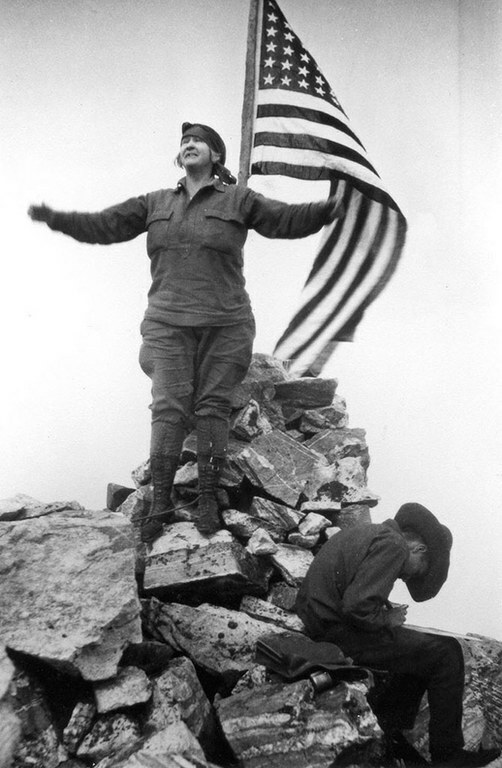 Geraldine Lucas, a retired schoolteacher and Wyoming homesteader, reaches the summit of the Grand Teton in 1924. Florence Blake Smith, a Chicago bookkeeper, writes that she learned about homesteading from a friend just before he set out for Wyoming. Her response: “If he could do it, I could, too.” She worked winters back in Chicago to earn enough to support her required seven months on the claim, but never gave up until the land was hers. Her success was typical; research shows that women homesteaders were as apt to succeed as men. Another Chicagoan, Nellie Burgess, 31, said she was persuaded by “the call of the outdoors” to give up her reporter’s job to file a claim in Idaho near the Snake River. She proved up her claim while also becoming a proficient hunter, gardener and fisherwoman. Women homesteaders were not necessarily fresh young things. In 1912, 47-year-old divorcee Geraldine Lucas homesteaded 160 acres at the base of the Grand Teton in Wyoming, and incidentally, became the second woman to climb its peak. Widows also saw homesteading as a way to support their families. Elinore Pruitt Stewart is perhaps the best known, because letters she wrote to her former employer in Denver were published in the Atlantic Monthly and then in a book, Letters of a Woman Homesteader. In the early 20th century, women back East talked earnestly of women’s equality. In the West, single women homesteaders demonstrated it. Women showed they could take charge, instead of just following along; women could support themselves, taking risks in an unfamiliar world. It is probably no coincidence that the Western states were the first to grant women the right to vote. What did single women homesteaders prove by proving up their claims? Like the women honored this year by the National Women’s History Project, they saw an opportunity and took it, leading the way for other women to do the same. Take, for instance, 2007 honoree Suzanne Lewis. She moved west from Florida to become the first female superintendent at Glacier National Park in Montana, and she is now the first woman to fill the top job in Yellowstone National Park. Her success in a previously male-dominated profession suggests new possibilities for young women contemplating careers today, just as women homesteaders did for women 100 years ago. Single women homesteaders remind us what a woman can accomplish with determination and hard work — a good thing to celebrate this March during Women’s History Month.